TaxiMobility is a long-established taxi management software, which is incomparable for its seamless performance and advanced features. However, we are on the verge to educate everyone in the ride-hailing industry to understand why they should go for branded taxi software like TaxiMobility rather than some random nonbranded taxi clone scripts or software. As a common man, you may go for a cheaper product that matches your budget. But, it should not be the case when you buy software or any other technological inventions for your business. When it comes to taxi business, you must be more careful while selecting taxi dispatch software as the quality of your taxi booking and dispatch apps decides the quality of your taxi service. Most taxi startups prefer to buy cheaper software to make their business presence online. They consider it as a cost-saving act; however, it is not the case. I would say they are simply wasting their money by buying a low-quality software built by unknown developers with minimal features. Getting software for on-demand ride-hailing is not just buying but also a kind of investment with which you must get a return, which will not happen when you go for cheap clone software. Acquiring taxi software is not a one-time process. It is a continuous process that the software must be upgraded periodically to satisfy the ever-growing requirements of taxi customers. It must also be packed with features that are required to meet the outgrowing standards of the ever-evolving taxi industry. 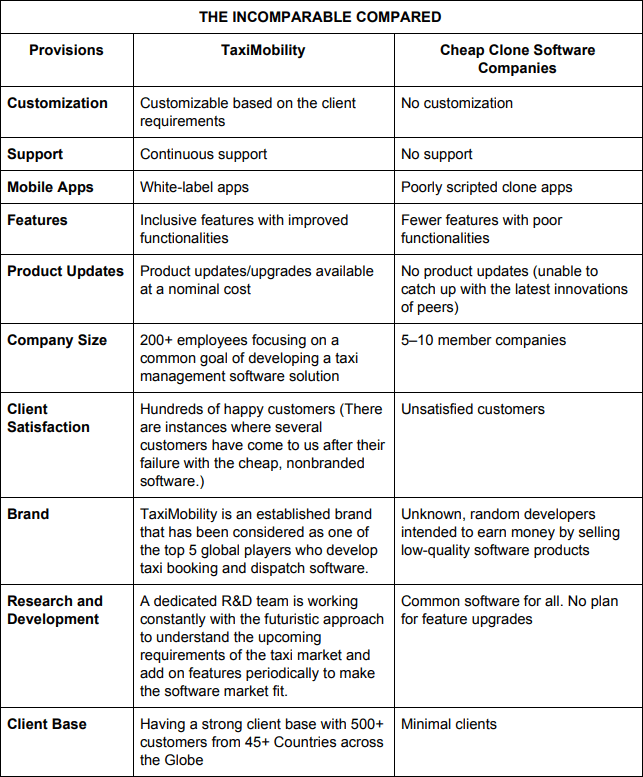 Before buying any software for your taxi business, know the difference between TaxiMobility and cheap, nonbranded taxi clone software. TaxiMobility is a brand that has been developed exclusively to support on-demand taxi businesses and has been enhanced with the upgraded features and seamless performance. It can support taxi companies of any size: startups to enterprises. TaxiMobility has a strong client base and has been the brand trusted by 500+ taxi companies across the globe for over years. TaxiMobility becomes a buzzword in the taxi market and has been recognized as one of the world’s leading taxi management software providers in various reports and researches.